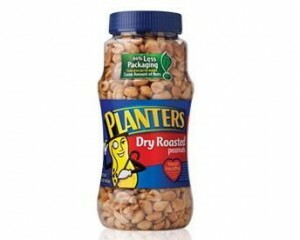 A blog from Sustainable is Good reports that in fall 2011, Kraft Foods’ Planters brand has launched new plastic packaging for all of its Dry Roasted Peanut Products as part of its sustainable brand initiative. The new plastic package is 100% recyclable, is BPA-free, and uses 84% less packaging material than the former glass jar by weight. Planters says the change from glass to plastic will result in an estimated 25% reduction in trucks on the road to transport the products. Combined with other efforts, Planters says it has conserved 5.6 million pounds of packaging and shipping materials. The company notes that it will continue to invest in greening its facilities through energy and water conservation, as well as waste reduction.